Cortana is a personal digital assistant built into Windows 10. Prior to Windows 10 and Cortana, most conversations involving a PC tended to be one-sided insults followed by an angry pound on the keyboard. But what if your computer not only listened to your words, but also behaved? That’s what Microsoft intends with Cortana, which tries to make your life a little easier. She can find missing files, for example, searching both your computer and Internet storage bins like OneDrive. Cortana’s help can go much further than simply gathering files, however. If you approve, Cortana works in the background, constantly gathering information she thinks you may need. Then, when you ask her to do something, she’s prepared to offer you particularly helpful information: local weather updates, traffic information about your commute, or perhaps a list of popular restaurants nearby. She can even remind you when your favorite band is touring in your area. Microsoft hopes Cortana will help not only your computing, but other aspects of your life. Cortana comes in the handiest when you’re on-the-go, armed with only a Windows 10 phone or small tablet. Just say, “Hey, Cortana,” followed by your question or command. A few seconds later, Cortana comes up with your information. Cortana works the same way on a desktop PC, provided you’ve attached a microphone. Or, you can just click the Search box next to the desktop’s Start menu. Cortana appears, ready for you to type in your question. After a moment of searching, she displays the answer, keeping everything quick and quiet. Cortana works in two ways. First, she checks your e-mail and calendar, if you’ve approved it, so she can automatically fetch details about your upcoming events. She knows the time and dates of upcoming appointments, for example, as well as up-to-date flight information for next week’s trip. Second, she’s connected to the Internet, so she can answer questions that you’d normally have to look up yourself: What’s the current exchange rate in Spain, for example? Will it rain tomorrow? How many grams are in an ounce? Until you’ve asked her a few questions, Cortana doesn’t know anything about your interests. 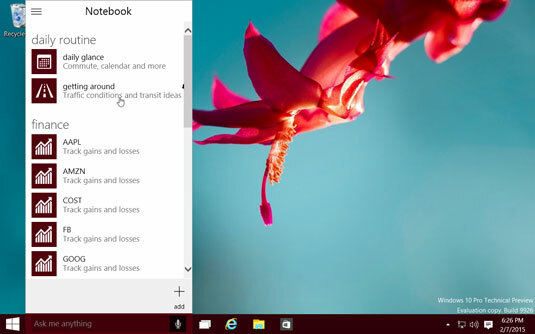 To make her as helpful as possible, spend some time with Cortana’s Notebook — a settings area where she lists things you’ve requested in the past. There, you can tweak what she already knows or add to her knowledge by checking off the subject you’re interested in. Cortana remembers your settings and syncs them with your other Windows 10 settings, letting her work the same on whichever device you sign in on with your Microsoft account. If you prefer, Cortana can even pass the information to other apps and services powered by Bing, Microsoft’s search engine. Or, if you don’t want any part of a new-fangled assistant in the clouds, Cortana’s Notebook also lets you simply turn her off. Although Cortana grabs her information both from your files and the Internet, she can’t do much if she doesn’t understand your voice. That’s where vocal training comes in. Treat Cortana as somebody who doesn’t understand your language, and can recognize only a few words. For best results, speak clearly and limit your vocabulary to simple expressions. If she still doesn’t understand what you’re saying, stick with the keyboard. 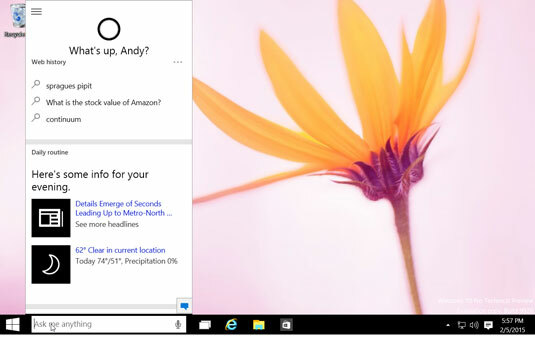 When you’re ready to try speaking to Cortana, start with the easy things, like asking about the weather. After you gain confidence in her abilities, you can move on to more complex tasks, like asking her to rearrange appointments on your calendar or send notes to your boss. Cortana may be a fad, or she may be the key to future computing. But either way, she’s ready and waiting for you in Windows 10.